Can you believe it is nearly Christmas?! SK Clinic + Spa will help you get into the Christmas Spirit. We are hosting our 10th Annual Christmas Party on Thursday 30th November, from 5pm until 8pm – it is free for all, so pop it in your diary and come and meet the SK team! There will be indulgent treatments, exciting demo’s, and fabulous offers on the night. All guests can enjoy an array of scrumptious canapés, kindly supplied by The Angel Hotel, complemented with a glass of fizz. Available on the night will be a selection of free treatments which must be pre-booked, however if you haven’t done so already, you need to sign up to our newsletter as we will be announcing some time in November when the pre-booking system is open! Don’t miss our treatment demonstrations of the Lash Perfect Lash Extensions, Lash Lift + Perm, Brow Shape, Tint + Fill, IPL Treatments and CACI Jowl Lift. There will be exclusive offers on each of the demonstrated treatments to take advantage of - so if you want to treat yourself do come along to find out more. Further exclusive ‘on-the-night-only’ offers include 20% off all Retail Products + Gift Sets, 10% off all Treatments purchased on the night, including monetary vouchers, plus back by popular demand is our “All I Want for Christmas” 3-hour Christmas Gift Package at an amazing discount, only available to purchase at the party. Get some Christmas shopping in at SK, as we have some tempting gift sets available including Pevonia’s new aroma-therapeutic BodyRenew collection, choose from three blissful scents, already presented in a chic gift box. Treat someone special (or of course yourself) to Pevonia’s luxurious limited-edition festive candle or reed diffuser, both will infuse your home with the sweet and delicious scent of Appel Strudel. There is also a selection of BareMinerals gift sets to leave your skin glowing and flawless, and irresistible OPI gift sets for beautiful, festive nails. Finally, SK will be holding a charity raffle with the opportunity to win an array of fabulous prizes. SK will be donating all proceeds of the raffle to the Frankie Dettori My WiSH Charity ‘Every Heart Matters’, which supports West Suffolk Hospital – so don’t miss out. SK will make sure you don’t go home empty handed if you don’t win in the raffle - all guests are gifted a goody bag on the way out. 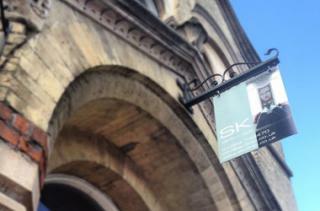 For more information visit www.skclinic.co.uk or call 01284 748470.